Instant Imprints Lawrenceville, GA | Custom T-Shirts, Embroidery, Signs and More! At Instant Imprints Lawrenceville, our customers come to us when they want to be more visible to their customers. We create that visibility five different ways: Branded Apparel (embroidery), Signs & Banners, Promotional Products, Custom T-Shirts and Print Services. Instant Imprints provides superior custom t-shirts, printing services, promotional products, custom banners and branded embroidery items to the Lawrenceville area. We’re proud to serve Georgia with the promotional products that local businesses need to ramp up their brand visibility. When you need the value and quality of a worldwide industry leader combined with the personal touch of a Georgia local, Instant Imprints in Lawrenceville is your source for promotional goods of all kinds! At Instant Imprints in Lawrenceville, we pride ourselves in having a set of core values that ensures that every customer leaves satisfied. We strive to get your job done right, the first time, so you can avoid the costly revisions that cut-rate print shops often require. In addition, we’re committed to delivering your products on time—or early—and answering any questions you may have in a timely way. Our Image Experts are dedicated to helping you achieve your visibility goals, every step of the way! Businesses around Lawrenceville know the power of custom t-shirts. Whether you’re looking to spread awareness about a product or event locally, or around the world, custom t-shirts can take you there. Our custom tees give you logo legs, with an unmatched level of quality and value. Our state-of-the-art printing processes can be perfectly tailored to meet your unique project needs. If you have any questions about what process is right for you, no worries—our Lawrenceville Image Experts are more than happy to help. 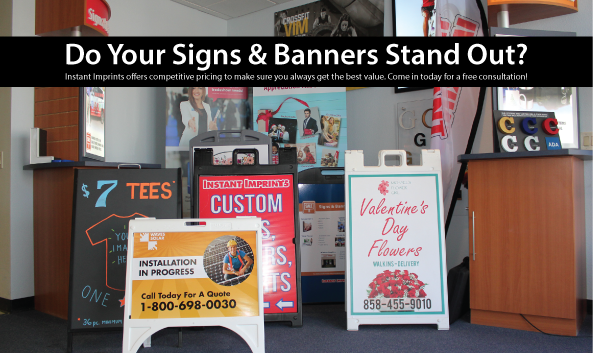 There’s no better way for your brand to stand out than with a superior sign or banner provided by Instant Imprints. We have a wide variety of customization options so you can give your message in a unique way. Whether you’re looking for a professional trade show display for your next industry conference, or you need a stylish new storefront banner, our Image Experts can help you craft the perfect sign to suit your needs. The end result is more brand visibility, which helps to drive business your way! When you’re ready to bring your brand visibility to the next level, Instant Imprints in Lawrenceville is your go-to spot. Stop by our showroom on Riverside Parkway, give us a call at (678) 518-5408 or request a quote online today!